David Golub awarded top USCL board 4 honors! Congratulations to NM David Golub for being named U.S. Chess League 1st team All Star for board 4 for the 2014 season. Link to report from the USCL website. 1st Team: NM David Golub (SEA). This was not a difficult decision as Golub had a near-perfect record (7.5 of 8 with a 2499 performance rating), with many instrumental wins along the way, several of which were critical to Seattle recovering from a tough start to the season and snagging the final playoff spot. According to team manager Josh Sinanan, "I can assure you that David will be graduating to board 3 next season!" Orlov 3rd Team Board One All Star! In addition, IM Georgi Orlov was named as the 3rd Team All Star on board 1, behind two GMs. Link to report from the USCL website. His record was 4.5 of 6, for a very impressive 2874 performance rating. Tied for 1st! Congratulations to Samir Sen of Washington for his 1st-place tie in the 12th grade section of the USCF K-12 Championships held Dec. 12-14 in Orlando, Fla. Samir scored 6 of 7, raising his rating to 2222, a solid master level. See the completed tournament news below for a link to the USCF crosstables for the grade-level sections of this event. In Memoriam - Elmars Zemgalis (b. September 9, 1923 in Riga, Latvia - died December 8, 2014 in Seattle, Washington) as reported by IM John Donaldson. He was the second oldest Grandmaster in the world (age 91) behind only Yury Averbakh (92). Elmars was Washington State Champion in 1953 and 1959. His best result was = 1st with Bogoljubow at Oldenbourg 1949 ahead of Rossolimo, Unzicker, O'Kelly, Saemisch and 12 other participants. Photo at left: Zemgalis at 90th birthday party in 2013, courtesy of Viktors Pupols and Deborah Petzal. 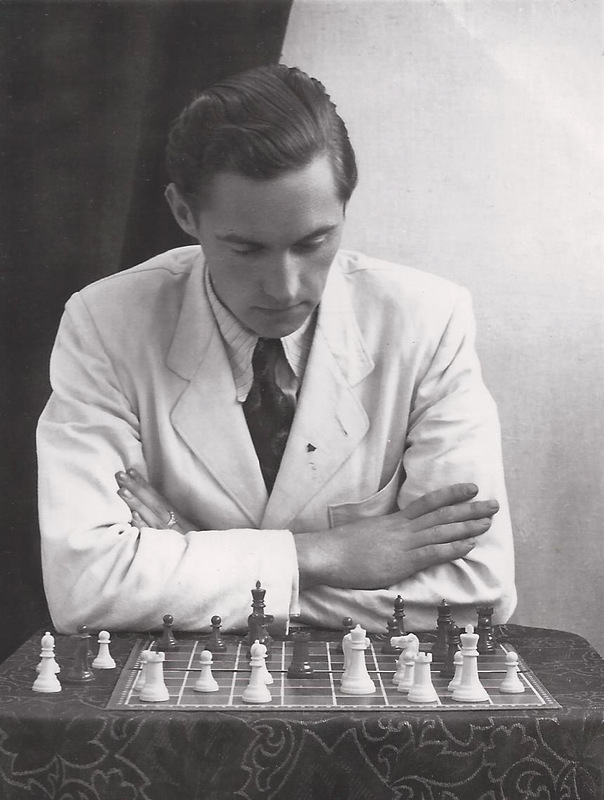 Photo at right: Zemgalis at chessboard in his younger days, courtesy of IM John Donaldson. December magazine! The December issue of Northwest Chess was mailed on 11/28. It's a 32-page issue with Oregon Chess News (includes Raptis vs. Koons match annotated by Koons), Idaho Chess News, Millionaire Chess Open and Western States Open, Washington Chess News, Chess Groovies by NM Daniel He and NM Samuel He, Journal of Chess Research Launches with De Groot Gala! by FM Loren Schmidt and a back-cover photo of Jazon Samillano with Morgan the Dog by Brian Berger. Cover: Darwin Porth on National Chess Day by Adam Porth. This is also the first issue printed by Sound Publishing Inc. of Everett, Wash. Photo at right: Northwest Chess editor Jeff Roland shows off the December magazine at the Boise Chess Club on December 8. 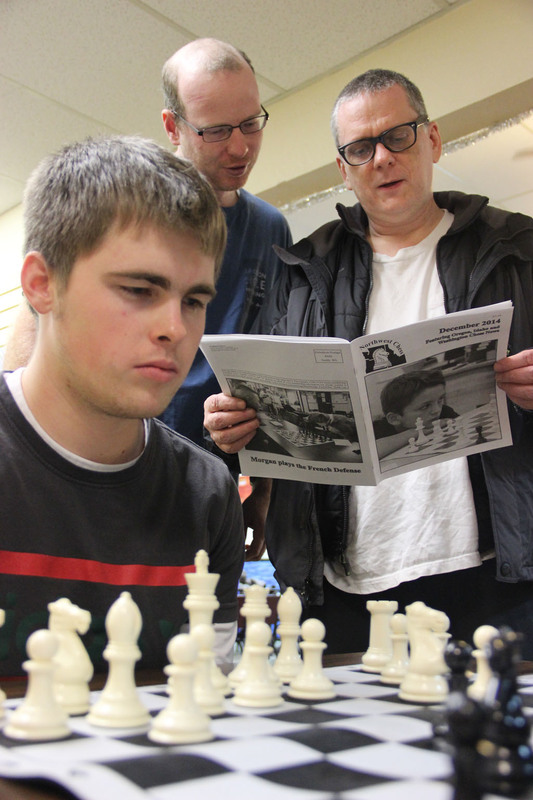 Left to right: Alex Machin (sitting at the chessboard playing), Corey Longhurst (standing next to Jeff, looking at the magazine) and Jeff (holding magazine). Photo by Jim Berezow. Note: Full version of this and earlier issues now available on the back issues page. World Championship Rematch! Carlsen wins and retains championship! World Champion Magnus Carlsen and Challenger Vishy Anand played the World Championship Match (actually rematch) in Sochi, Russia, November 7-23, with Carlsen winning 6.5-4.5, thus retaining his championship title. Carlsen won games 2, 6 and 11, and Anand won only game 3, although he missed a Carlsen blunder in game 6. The FIDE President previously invited the Prime Ministers of Norway and India to the opening ceremony and to the "first move." The FIDE President also invited all World Champions to the ceremony, which took place on November 7th. Official match website. Seattle Sluggers eliminated in wildcard round! This year's Sluggers season (as part of the United States Chess League), which started on 8/27, is now over, with the Sluggers eliminated in the wildcard playoff round on Wednesday 11/5 against New Jersey. The Sluggers finished the regular season 4.5-5.5, managing three impressive 3.5-0.5 wins during the season, over San Francisco, Rio Grande and New Jersey. Background: This year we welcomed USCL rookies FM Bill Schill and NM Samuel He and welcomed back NM David Golub, who last played for the team in 2011. The 2014 Sluggers roster included IM Georgi Orlov, GM Emil Anka, FM Costin Cozianu, FM Tian Sang, FM Curt Collyer, NM Roland Feng, NM David Golub, FM William Schill and NM Samuel He. The team manager was Josh Sinanan, assisted by Tian Sang. The local TDs were Bert Rutgers and Mark Smith. The Sluggers played at the Orlov Chess Academy in Redmond. FIDE supports new journal advertised in NWC! FIDE has written a letter of support for the Journal of Chess Research, an interesting new journal advertised (with a call for papers) in the November issue of Northwest Chess (see below). November magazine! 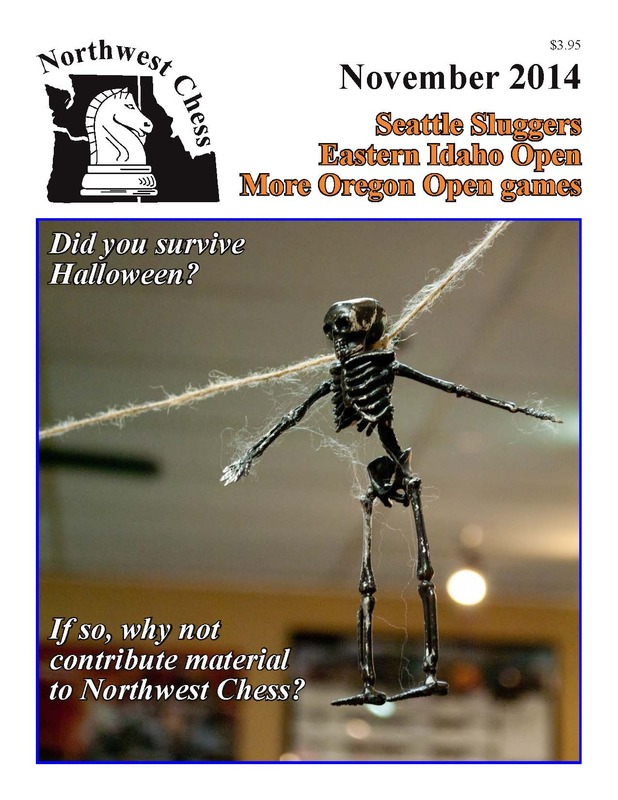 The November issue of Northwest Chess was mailed on 10/23, and it's a little scary! 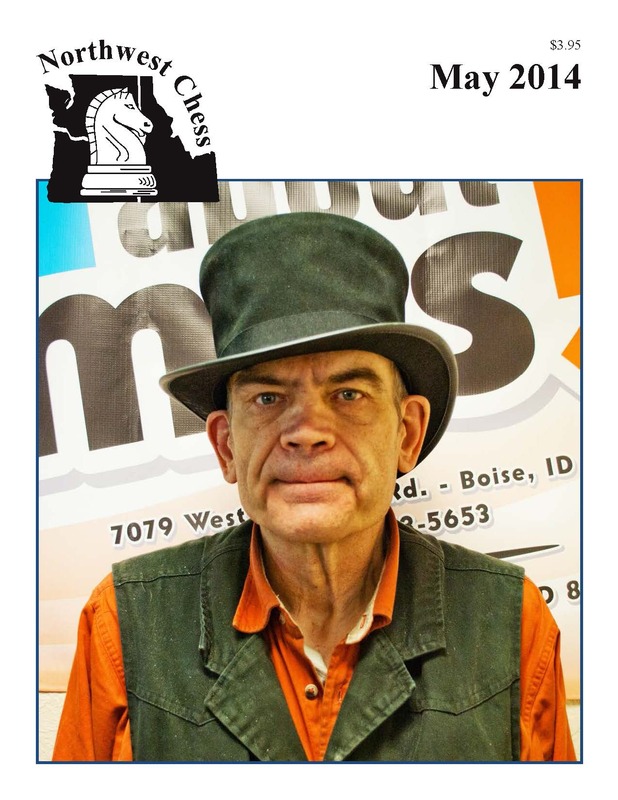 It's a 32-page issue with "The Game Of Chess Is The Clue To Success" Crossword Puzzle by Carol Kleist, Washington Chess News, Idaho Chess News, Oregon Chess News and a back-cover photo of Alex Lopez at the Boise Chess Club by Jeffrey Roland. Cover: Halloween decoration taken Oct. 6, 2014 at the Boise Chess Club by Jeffrey Roland. Note: Full version of this and earlier issues now available on the back issues page. Match of State Champions! An intense six-round weekend match was held Oct. 11-12 at the Portland Chess Club between Washington state chess champion Nat Koons and Oregon state chess champion Nick Raptis. Games were played at a time control of G/100 minutes plus a 30 second increment per move. The match ended in a 3-3 tie with all games being decisive; there were no draws! The prize fund of $1,200 will be evenly split between the two players. A report on the match (with games) will appear in a future edition of Northwest Chess. October magazine! The October issue of Northwest Chess was mailed on 9/30. it's a 32-page issue with annual USPS Statement of Ownership, From The Editor, Idaho Chess News, "Northwest well represented in 2014 SPFGI" by Frank Niro, Washington Chess News, Oregon Chess News and a back-cover photo of Hank Harris’ Chess Set by Jeffrey Roland. Cover: Esteban Ruiz Proaño by Jeffrey Roland. New IM! Michael Lee has officially become the newest International Master from Washington State. Michael achieved his three IM norms in the following events: 37th Annual World Open (2009), 1st Metropolitan International (2011), and 22nd Annual Chicago Open (2014). Michael was a member of Seattle Sluggers from 2006-2010 and a three-time scholastic national champion. He is currently a senior at Princeton University. September magazine and 800th Issue! 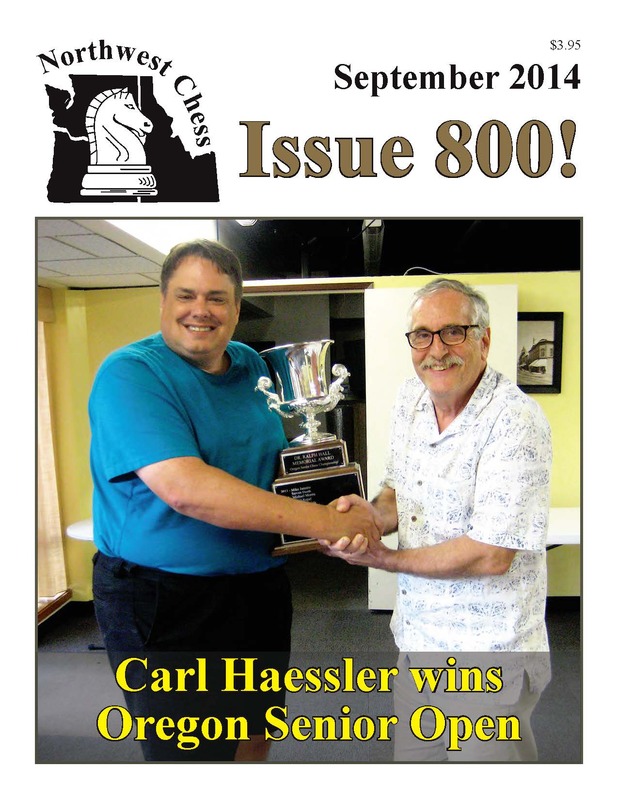 The September issue of Northwest Chess was mailed on 8/21. It's a 32-page issue with the Fremont Troll (! ), "Northwest Chess wins CJA Award! ", Oregon Chess News, Book Review by IM John Donaldson, Idaho Chess News, Washington Chess News and a back-cover photo of "Jerrold Richards plays banjo at PCC Summer Open" by Brian Berger. This is the 800th issue, dating back to the first Washington Chess Letter in Nov. 1947. Cover: Carl Haessler wins fourth annual Oregon Senior Open, presented by Mike Morris. Photo by Brian Berger. Northwest girls at Susan Polgar Girls Invitational! The following local players participated in this event held in July: Andrea Botez and Lauren Mei Calora from Oregon, Olga Cherepakhin from Washington and Carmen Pemsler from Idaho. Additionally, Alise Pemsler and Andrei Botez were on the TD staff this year. - Reported by Frank Niro. See blog post. Scholastic Stories! See "Human chess game at Centro Cultural (Cornelius, OR) gets many students involved" story and video from The Oregonian (8/16) and "Pan-American Youth Championship" Chess Travel blog post (7/21) from the Bashkansky family. Northwest Chess wins CJA Award! 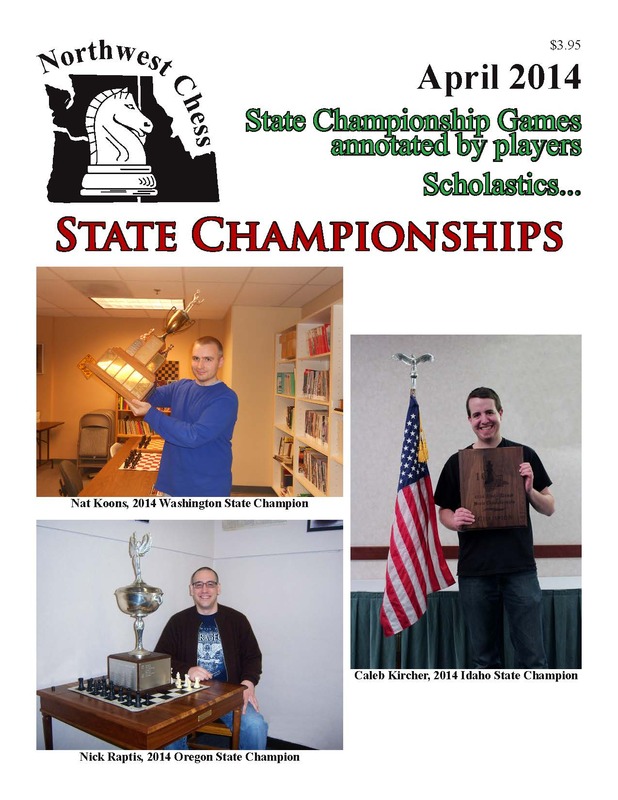 Northwest Chess has been selected as the Best State Magazine/Newsletter by the Chess Journalists of America as part of the 2014 CJA award program. See the list of winners, and congratulations to NWC editor Jeff Roland! GP standings! Elena Donaldson Akhmylovskaia Memorial Northwest Chess Grand Prix Standings for 2014: See 2014 Grand Prix standings alphabetically | See 2014 Grand Prix standings (by score) by state (updated as of July 28, except Portland July G/60). August magazine! The August issue of Northwest Chess was mailed on 7/29, however due to a mailing error, a separate mailing was done for new subscribers and persons with updated addresses. If you're in this category and didn't receive a magazine, please email info@nwchess.com. 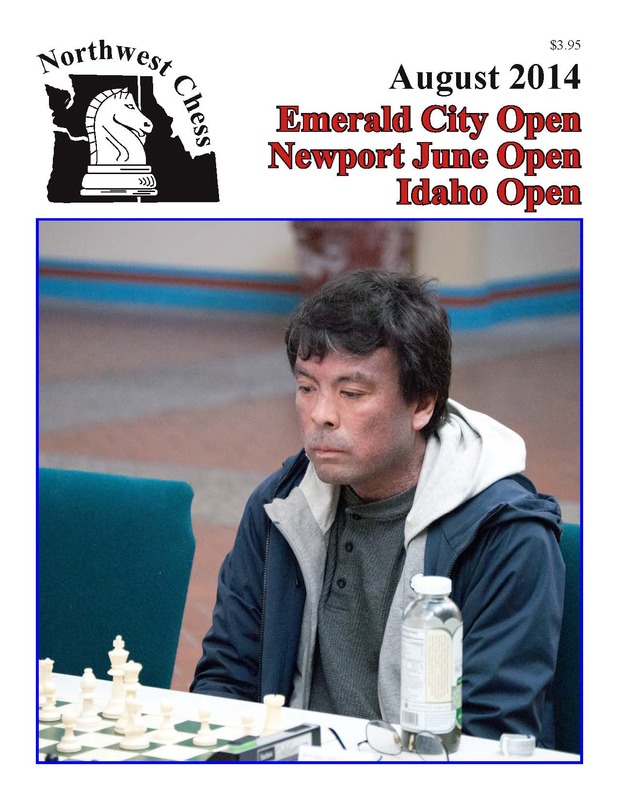 It's a 32-page issue with Washington Chess News, Idaho Chess News including a reprint of "Fifty Years of Idaho Chess," Oregon Chess News and a back-cover photo of Harry Buerer at the Newport June Open by Suzy Buerer. Cover: Frisco Del Rosario at the 2014 Idaho Open. Photo credit: Jeffrey Roland. Berry article! In an article on his website, Jonathan Berry of Canada discusses his "Career as a Chess Arbiter, Referee (and) Tournament Director," and mentions former NWC Business Manager Rusty Miller. July magazine! The July issue of Northwest Chess was mailed on Monday 6/23, less than three weeks after the June issue was mailed! It's a 32-page issue with Washington Chess News, Oregon Chess News, "Oregon’s Andy Trattner: From Chess to MIT" by Brian Berger, Idaho Chess News and a back-cover photo of the newly elected WCF Board of Directors by Jeffrey Roland. Cover (left): Roland Feng in his victory pose at the 2014 Washington Open. Photo credit: Jeffrey Roland. June magazine! 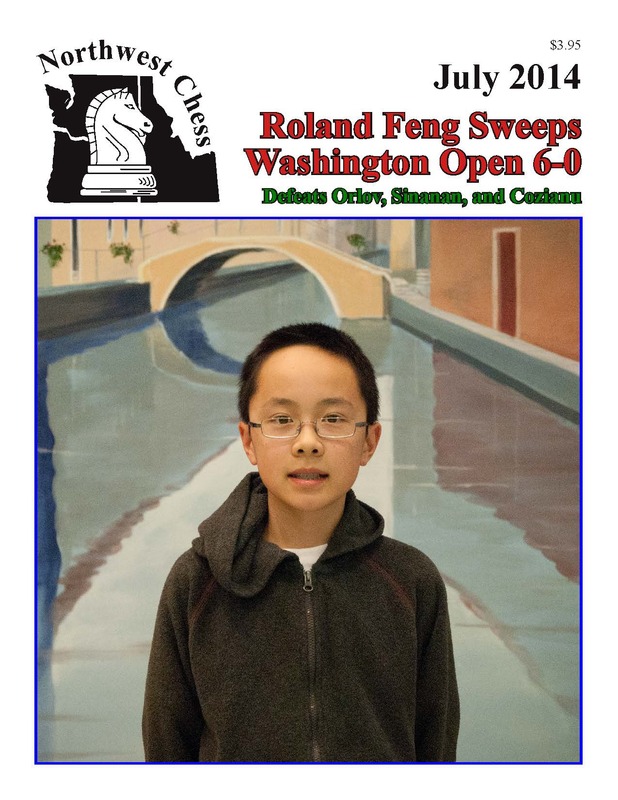 The June issue of Northwest Chess was mailed on Tuesday 6/3. 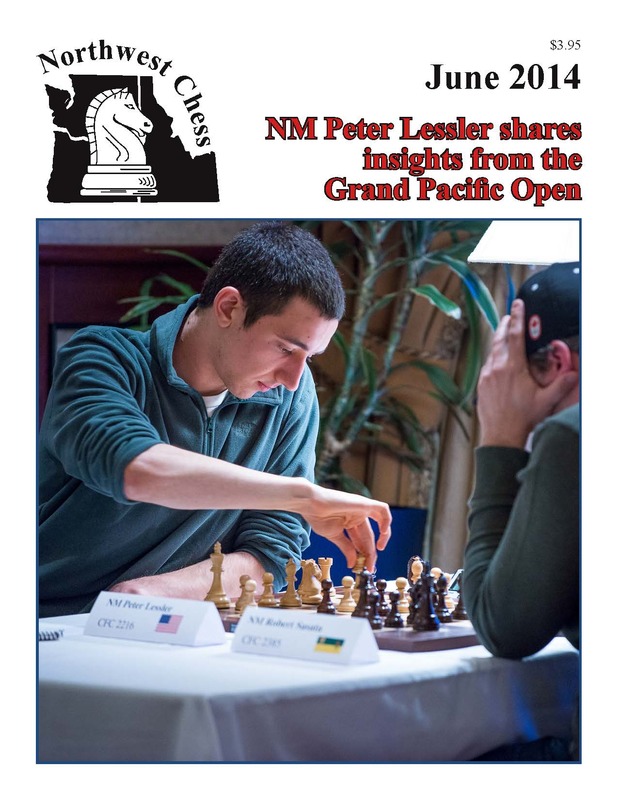 It's only a 24-page issue (due to a shortage of material) with Insights from the Grand Pacific Open by NM Peter Lessler, Washington Chess News, Oregon Chess News, Idaho Chess News and a back-cover photo of Nick Raptis at the Clark Harmon Memorial Open by Joshua Sinanan. Cover (right): Peter Lessler at 2014 Grand Pacific Open by Blue Giraffe Photo. U.S. Champions! Gata Kamsky and Irina Krush repeat as U.S. Chess Champions - see story on USCF website. Previous story: The U.S. Chess Championship and U.S. Women's Championship will again be held in St. Louis, May 7-21, followed by the U.S. Junior Closed Championship, June 20-July 3. See a blog post by Rusty Miller. The field and commentators for the championships were announced ... see USCF story. May magazine! 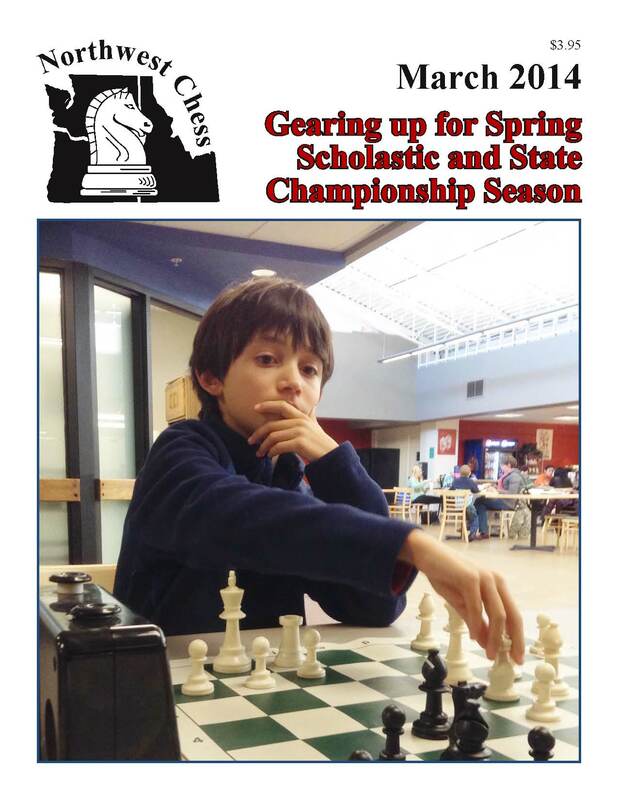 The May issue of Northwest Chess was mailed on 4/29. 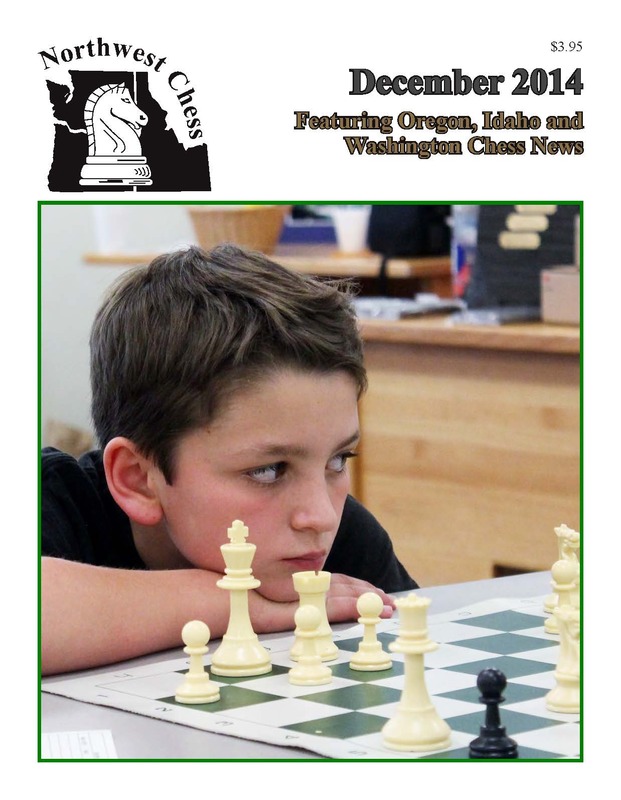 It's a 32-page issue with Washington Chess News, Oregon Chess News, Book Reviews by IM John Donaldson, Idaho Chess News, and a back cover photo of the Coquille Chess Team at K-12 National Chess Championship in San Diego by Nancy Keller. Cover (left): Hank Harris at the BCC #2 Tournament in Boise by Jeffrey Roland. Donations Suggested! The American Red Cross is encouraging people who want to help those impacted by the mudslide in Snohomish County to consider making financial donations. For additional information, contact the Red Cross at www.redcross.org/wa/everett or call: 1-800-RED-CROSS (733-2767). Northwest Chess magazine is printed at Snohomish Publishing Co. in the city of Snohomish, Washington. Updated! Most Active Players! Rusty Miller reports that the following chess players in the Northwest have been most active in USCF events since online recordkeeping began in the early 1990s: August Piper (Seattle) 785 events, Nick Raptis (Portland) 691 events, Stephen Buck (Tacoma) 541 events, Fred Kleist (Seattle) 511 events, David Griffin (Spokane) 509 events, Viktors Pupols (Kingston) 419 events and Jim Waugh (Spokane) 417 events. Did we miss anyone? Scholastic Story! See "Chess Wizards bring magic to classic game" (Mar 14) from the Maple Valley Reporter. Scholastic Video! See "Chess teaches elementary students more than moves" from Spokane Public Schools. March magazine! 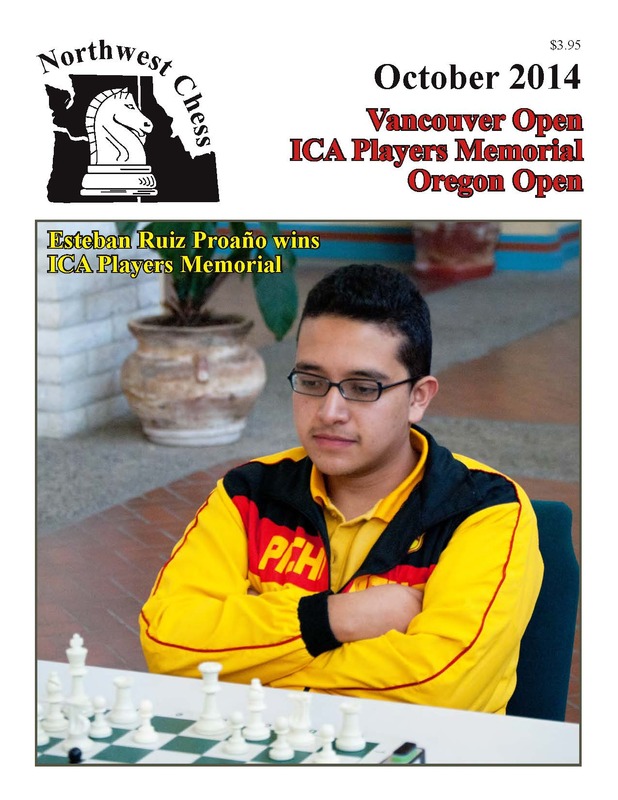 The March issue of Northwest Chess was mailed on 2/27. It's a 32-page issue with State Championship Early Report, Rusty’s Chess History by Russell Miller, Oregon Chess News, Seven Book Reviews by IM John Donaldson, Elliott’s Chess Tips by NM Elliott Neff, Washington Chess News, The Dialogue That Ends With A Point by Jacob Stinar and Jeffrey Roland, Idaho Chess News and Andre Murphy at the Mountain Home Open by Jeffrey Roland (back cover). The front cover features Quentin Van Law at Dragon Chess Open. Photo by Adam Porth. Carlsen chess app! Magnus Carlsen officially launched his iOS chess app on 2/26: Play Magnus. In this app you have a chance to play against a Carlsen-tuned chess engine. Play Carlsen from the age of 5 up to present day. Includes exclusive training video content by the World Champion himself. Download the app for free on the App Store: http://appstore.com/playmagnus. In another story about Magnus, Chess4Life founder Elliott Neff had the opportunity to meet Carlsen at a luncheon in San Francisco in January ... see the story. Now at Princeton! Former Washington junior chess star Michael Lee now attends and plays for Princeton University ... see "Princeton a Repeat Champ at Amateur Tournament" in the New York Times. In Memoriam - The Spokane Chess Club reports the death of Bill McBroom, 1937-2014. Regional chess, and the Spokane Chess Club in particular, suffered a huge loss with the recent death of Bill McBroom in Missoula. Bill, a retired professor of sociology at the University of Montana, was instrumental in building the chess relationship between Spokane and Missoula. He was a regular at the Collyer Memorial since the second Collyer in 1994. Bill was one of the original supporters of the Gary Younker Foundation and worked hard to promote chess in Montana, Spokane and northern Idaho. Kasparov Story! See "What is Garry Kasparov's Next Move?" from the Smithsonian Magazine website. Scholastic Article! See "A mighty fine chess player" from the Stanwood Camano News (Feb 18). Congratulations ... to the Seattle Seahawks on their dominating Super Bowl victory. Now want to find out who's going to win the state chess championship? ... Visit the Seattle Chess Club or follow our coverage online. [The Oregon and Idaho state chess championships were also contested in February ... see above.] More chess in Seattle ... see "In the Disquiet of Downtown, a Community of Chess Players Thrives," about chess in Westlake Park, from Seattle Weekly. Portland Chess Club website updated! The Portland CC has a new website which improves its appearance as well as accessibility of past tournament results and future tournament information. Check it out at http://pdxchess.org/. Interesting article! See Portland Chess and Go Programs Booming on the American Go Association blog. Another chess movie! See Rusty Miller's blog post about the chess-themed movie Life of a King. January magazine! 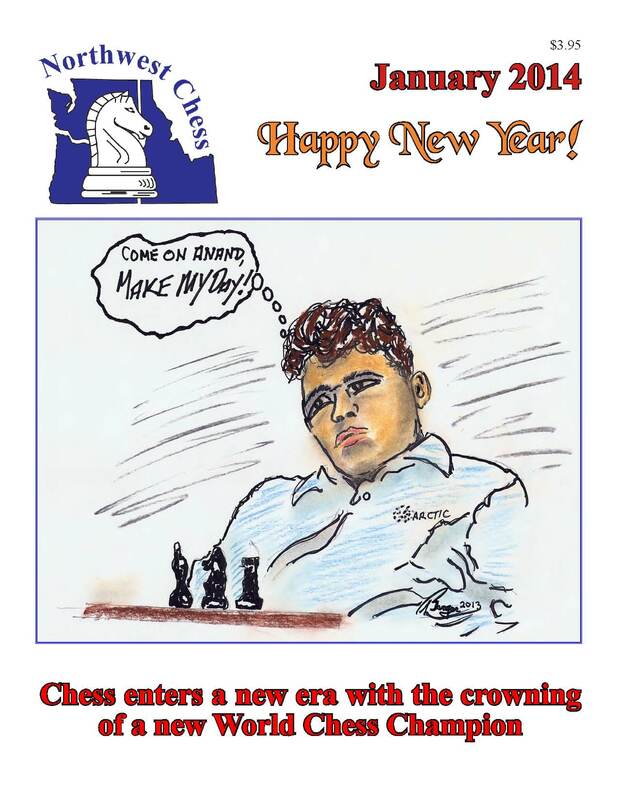 The January issue of Northwest Chess was mailed on 1/2. 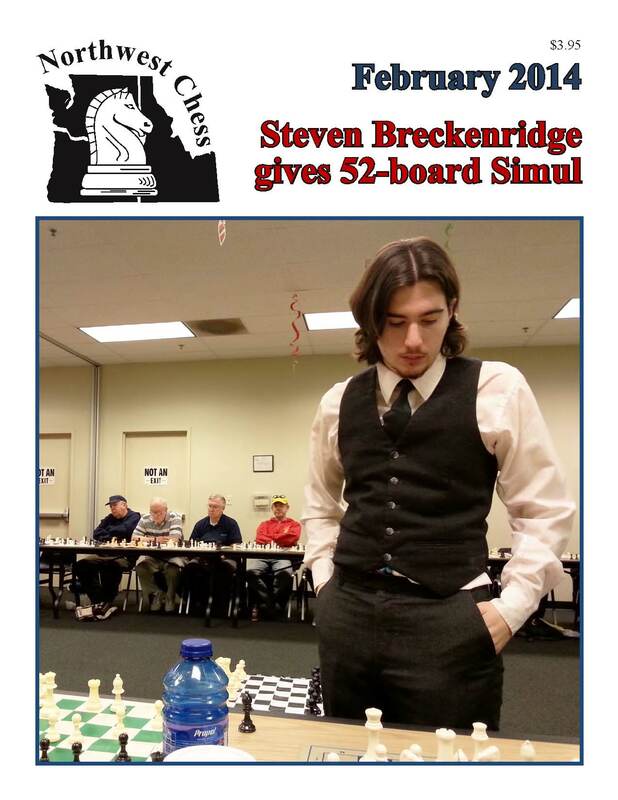 it's a 32-page issue with Oregon Chess News, Idaho Chess News, Washington Chess News, World Chess Championship Games and collage of three pictures of Jacob Stinar juggling chess pieces while balancing a chess king on his forehead by Jeff Roland. 8 pages of this issue were printed in color! Cover: Magnus Carlsen as drawn by local artist, Brian Berger.